I woke up late on Friday (blame the open bar at the “Draw Party), feeling a bit hung over but very optimistic about seeing the drivers hit the track at full speed. I got there so late that I only got to see the media ride along 🙁 – bummed. A bit late here – but better late than never. 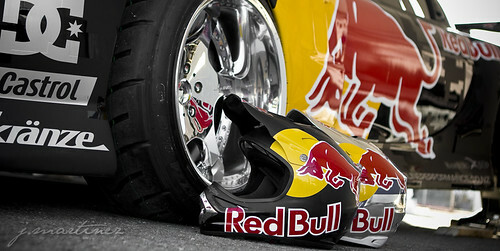 I’ll work on posting a Day by Day photographic blog-post of the Red Bull Drifting WC Weekend. Starting with Thursday, I arrived at the track around 2pm and headed straight away to Mad Mike FD Car. Also John P. Scion TC build from SEMA check it out also at the SCION Booth…enjoy! Formula DRIFT at the LA Auto Show Next Weekend! Don’t miss the world famous LA Auto Show opening next weekend from Nov 21 through the 30th, featuring the world debut of the all new Nissan 370Z, the 2010 Mustang and other never-before-seen rides from Mazda, Honda, Lexus, Lamborghini, Porsche and many more. Check out laautoshow.com for tickets and more info.